Dont wast your time or money! I purchased this detector for salt water beach hunting. It cannot function near salt water...Its useless. Don't waste your money. 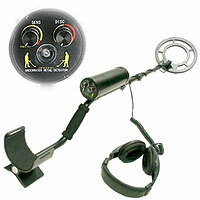 Great detector for the price!! I have used this detector for over a year and have found items on the beach, the surf, and even 10ft underwater off the shore. My buddy uses an underwater detector that he paid $1200 for and this one works every bit as well. His has a few more options, but for $200-$300 you cannot beat this detector! I am not sure why there are some bad reviews for leakage. If you keep the caps tight and don't submerge it under the rated depth you might not have any problems. How best to describe this cheap made chinese "colander".The one item missing in the specifications is how many litres of water it absorbs once submerged for 15 seconds or less!! Does it actually detect metal underwater? I never got to find out as you can probably tell from reading the above. STEER CLEAR unless of course you enjoy throwing money away. I bought the AquaVision off Ebay 5 years ago. Before I used it, I made sure both end caps were tight. Disc is a little sloppy, but the machine works good. Head phones still work good after all this time and use. I have other detectors, cheap and high end, this one rates average. I have used it in Florida, NC, and California. Works fine. I bought a viper trident from kellyco 3 years ago and returned it and lost the 20% restocking fee. The headphone pads kept falling off, real junk. These are the same detectors with different names. How can kellyco sell these chinese junks????? Bought an Aquavision Pro and couldn't wait to get to the beach. It falsed a lot in the dry and wet sand, but when I took that bad boy into the surf it fizzled out in about 15 seconds. I left it there, not even wasting the time to take it to a trash can. Within minutes I see a small boy bringing it onto the beach with a big smile on his face. His dad took it and attempted to turn it on for about 5 minutes. All of a sudden I see him chopping and hacking the beach with it. It must have shocked him or something. He took what was left of it and slung that mo fo into the ocean. Made me feel good. Don't even buy one of these, Chinese cr*p worth about £20 in UK money they should not be aloud to sell these machines on ebay, so stay clear of machines & tell your friends, even a child would think of these being cr*p. Wagga from bournemouth. Not even worth one star..
What a rip! Absolute garbage. I too was an idiot who handed over about $150 to the guy on Ebay. These are mass produced piles of s***. Went about 10 feet underwater and the thing filled with water. I found out the cost from China on one these was about $40. Anyone can get them from China and call them whatever they want and sell them. I'll save up for a while and buy a Whites or Garrett. I bought this exact thing through Kellyco where it is relabeled and renamed the Viper Trident. To start off when I received it and put it together the search coil was 45 deg offset from the controls. I Emailed Kellyco and the service was good,they sent me a new lower rod,but it was too big (circumference) and would not slide into the tube on the control housing! Finally I just decided the heck with it and drilled a new hole in the original rod that fit to properly line up the coil. Bench tested it and got a quarter at about 5 inches and dime about 3.5 inches. I paid $149.00 for this while I see it being sold for $458 with a MRSP of $895.00 these prices are total rubbish!!! $149. was too much! It is cheaply made Chinese garbage! The reason I gave it a 2 instead of a 1 is because it will pickup coins very close to the surface and my 8 year old kid can use it. I haven't had it in water yet, but I suspect when I do that will be the end of it and I'll be testing out the 5 year warranty. The thing I have trouble understanding is why a company with the reputation and good service of Kellyco would bother even selling stuff like this. I will be buying a water detector this summer (Tesoro or Minelab) but I am going to have a second look at a few other dealers since Kellyco talks up the Viper Trident as such a great detector,in my eyes this destroys some of their credibility especially passing it off at $895.00 MSRP.